A prime minister so lacking in human qualities that she soon requires a system reboot. 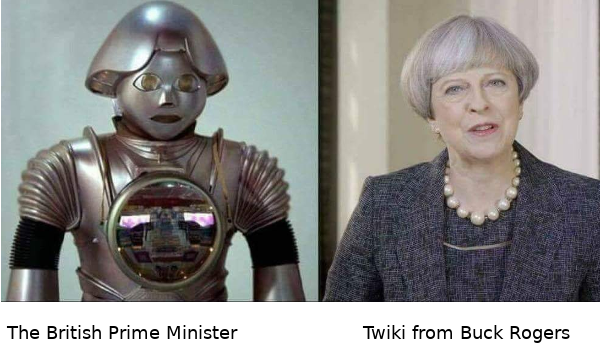 However, I wonder if our mainstream media have ever noticed the striking similarity between Theresa May and Twiki, the robot assistant of the eponymous hero of Buck Rogers in the 25th Century? Twiki was mainly voiced by the late, great Mel Blanc, who provided the voices for the likes of Bugs Bunny, Daffy Duck, Porky Pig, Tweety Bird, Sylvester the Cat, Yosemite Sam, Foghorn Leghorn, Marvin the Martian, Pepé Le Pew, Speedy Gonzales, Wile E. Coyote, Road Runner, the Tasmanian Devil and many of the other characters from the Looney Tunes and Merrie Melodies cartoons stables. If, in addition to these vocal talents, he could be brought back from the grave to speak well and lie badly, the Maybot might sound less like an automaton. We of a certain vintage remember our reading included following Dan Dare’s adventures in space against his arch-enemy, The Mekon, who with his shaven pate, does a remarkable impression of Sajid Javid, the current Home Secretary, who has recently been ushered into 2 Marsham Street, London SW1 with his dustpan and new broom to clear up the mess the Home Office has created in recent years in relation to the so-called “Windrush generation“. 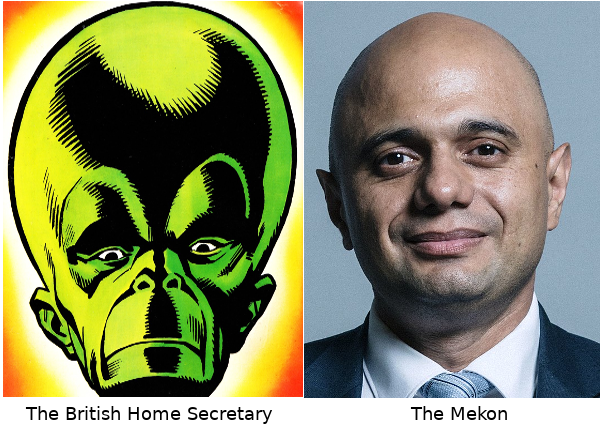 Incidentally, Javid is not the first Conservative Cabinet Minister to be compared to The Mekon. One of his partisan predecessors, the late Angus Maude, who was Paymaster General in the government of Margaret Thatcher from 1979 to 1981, was nicknamed The Mekon. This entry was posted by Steve Woods on May 7, 2018 at 13:48, and is filed under Language, Media, Oddities, Politics. Follow any responses to this post through RSS 2.0. Both comments and pings are currently closed.